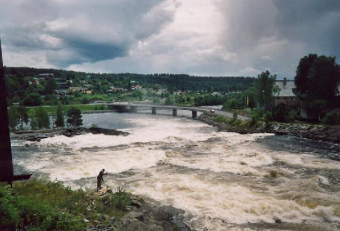 Kongsberg is wonderfull placed by the river "Numedalslågen". The city have approximately 25 000 inhabitants. The city have a lot of engineering industry developing products for aircrafts, automotive, space, marine, and offshore/ oil industry. The city grew up during 300 years of silver mines activities. A lot of monuments/ museum and mines are still available for tourist. We can recommend a tour with the small train inside the silve mines. Kongsberg have every summer a big jazz festival with famous artist from all over the world. In the summer ist possible to fish salmon not far from the city. Kongsberg is easy avalilable with train and bus from Oslo and the airport. ©2007 Visit-Kongsberg.com Kopiering fra siden er ikke tillatt uten samtrykke.